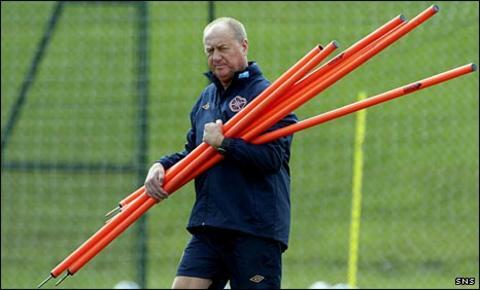 Hibernian have confirmed former Hearts assistant manager Billy Brown as Colin Calderwood's number two at Easter Road. "It is a new challenge a new chapter in my career and I'm looking forward to it," said Brown, who was sacked by Hearts in August. "I want to help Colin to enjoy success this season." Calderwood added on the Hibs website: "I am delighted to be able to add someone with Billy's experience drive and enthusiasm to the backroom staff." The 60-year-old Brown left Tynecastle in August after Hearts owner Vladimir Romanov removed Jim Jefferies as manager and brought in former Sporting Lisbon coach Paulo Sergio. Brown and Jefferies started as a managerial team with Berwick Rangers in 1988 and were also together at Falkirk, Hearts, Bradford City and Kilmarnock before starting their second spell with the Edinburgh club in 2010. "I've still got lots of enthusiasm for the game and the ambition to do well," said Brown. "I think Colin has a good chance of doing well at the club and hopefully my experience can assist him to achieve that goal. "When I spoke to Jim about this opportunity, he told me to go for it and that I had his best wishes. "There aren't many jobs in Scottish football more desirable than working for Hibernian." Calderwood, whose side sit bottom of the Scottish Premier League, has not had an official assistant since Derek Adams returned to Ross County as manager in May. Since then, former caretaker Alistair Stevenson, Hibs' first-team coach, has been the most senior member of staff below the former Nottingham Forest manager. "He will be a real asset to the coaching team," said Calderwood. Billy is a Musselburgh man and very focussed and passionate for whichever club he works for. "What I like about him is that he stands his corner and backs his players. He is totally committed and a great character to have around the place. "Whenever I've come across Billy in the past I''ve been impressed by him both as a coach and as a person and I'm looking forward to working alongside him." Calderwood does not believe Brown's Hearts pedigree should be any barrier to his succeeding in Leith. "I would hope not," Calderwood said. "People who know Billy know he is from our area and it's his experience and quality which will be a terrific help for us all."